You know Elon Musk, right? The South African tech entrepreneur who made his fortune as co-founder of PayPal, and now makes spaceships, electric cars, flamethrowers and epic Twitter lols. However, for all his successes and achievements, he’s also something of a liability. From getting Tesla into legal hot water for insider trading allegations, to being rumored to tweet while under-the-influence, he seems to be putting his companies into unnecessary bother. But is he always to blame? While it’s tempting to view every Musk misstep as cause for a fall in Tesla’s fortunes, the cause-and-effect isn’t always so straightforward. We’ve taken a look back at the Tesla share price over this past annus horribilis for Musk to work out whether his company has been footing the bill for his foot-in-mouth moments. So, does Tesla’s share price really fall every time Elon Musk slips up? Not so much. Tesla’s share price grew after Musk lambasted investors for their “Boring bonehead questions”. Also, after calling a British rescue diver a “pedo guy” for living in Thailand, the share price grew by over $2. After announcing they were making 9% of the Tesla workforce redundant, the share price jumped by nearly $11. When Musk launched an old Tesla Roadster into space, creating a sizeable piece of space garbage, the Tesla share price increased by just under a dollar. After criticizing journalists on Twitter and then trying to create an independent journalist-rating website, the Tesla share price drops by nearly $10. March wasn’t great for Musk, either. The launch of the Boring Company’s ‘Not-a-Flamethrower’ was met with scorn, and the share price dropped by $5. Then, a Tesla Model X was involved in a fatal crash while on Autopilot – the share price dropped by nearly $8. March came to an end with Tesla having its credit rating downgraded, with shares plummeting by $25. A tell-all interview in the New York Times was published in August, and the share price fell by nearly $30. Then, earlier this month, Tesla was ordered to defend itself at trial over allegations of breaking employment laws in the US. Shares fell by nearly $10. Is Elon Musk to Blame Every Time? As the CEO and chairman of Tesla, the buck does ultimately stop with old Elon. However, it’s difficult to say that every issue facing the electric car company is directly because of Musk’s actions. The fatal Autopilot Tesla Model X crash, which saw share prices plummet by nearly $8, seems to have been due to a combination of driver error and software error. This can hardly have been the fault of Musk directly, given the volume of Autopilot journeys on the same route. Although, it has to be said that Tesla’s corporate communications should have been less adversarial during the subsequent investigations. When rapper Azelia Banks posted several Instagram Stories claiming, among other things, that Musk tweeted whilst on acid, you could hardly blame Musk for a negative reaction. Yet, strangely, none came. Tesla’s share price remained stable, and rose by just under a dollar. We can’t always let Musk off so lightly, however. 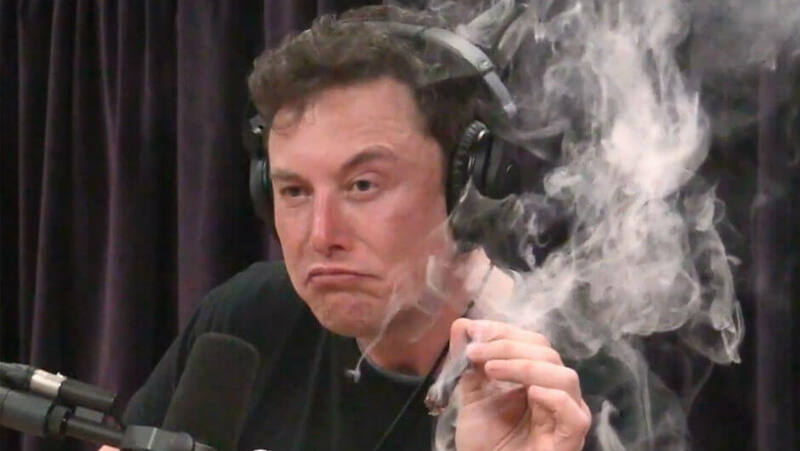 The blame for Musk’s joint-toking Joe Rogan show appearance lies solely at the South African’s feet. Share prices dropped by $17 the following day and it even led to NASA taking a look into Musk’s drug use, as his SpaceX company is a NASA supplier. Musk must shoulder the blame for the insider trading debacle which cost the company $20m in fines and Musk his chairmanship of the car company. After tweeting back in August that he was considering taking Tesla private, and that he had “Funding secured”, the Securities and Exchange Committee (SEC) announced it was going to be looking into Musk’s comments. The Tesla share price dropped by nearly $18. Then, in October, Tesla settled with the SEC. In order for the charges to be dropped, Musk had to step down as chairman and the company had to pay a $20m fine. While this may sound like bad news, the share price actually jumped by over $45 as the markets appreciated the resolution and, potentially, a diminished role for Musk. Looking back at his year though, it’s clear that it’s not always Musk’s fault, but usually is. Want to know more about Musk’s mishaps? Is Space Actually Being Democratized? Is the Future of Esports in Arenas or Arm Chairs? Two recent investment deals in amateur esports and an esports arena show the competing visions for the future of competitive gaming. But which will win out? We examine the current state of play to find out.